Keeping your lawn and plants healthy and vigorous during the summer is a challenge. You have to spend the time watering the lawn – a good soaking takes two hours – and deal with tangled hoses and broken nozzles. Underground irrigation is Aqua Bright’s specialty, and after almost two decades in the business, we’re experts at installing lawn sprinkler systems and their controls. cool the plant surface and air that surrounds the home or commercial building, through the process of plant evapotranspiration. When compared to hand watering with hoses and sprinklers, these automatic systems give more uniform coverage and can reduce water loss by not watering sidewalks, streets and buildings. In addition, irrigation can be automatically scheduled to avoid peak residential water demand, which is important when using municipal water. 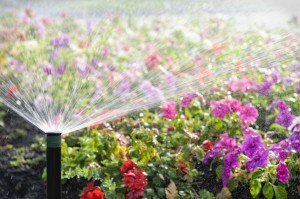 Although an automatic timer may be set to irrigate several times a day, every day and at various time intervals – DON’T. Instead, use good judgment to decide when irrigation is needed, then either (1) manually set the clock to automatically rotate through the different stations (valves/zones), (2) program the system for one irrigation to occur; for example the next morning, or (3) set the automatic timer to provide one or two irrigations per week with either automatic or manual cutoff if significant rainfall or mild weather occur. However, it is best and most economical to initiate watering only when drought becomes evident. When is Turf Too Dry? no rain has occurred for about one week and hot, dry, sunny, windy weather persists. The very best way to determine if irrigation is needed is to probe the surface soil and determine if the surface inch or two is visibly dry. This entry was posted on Friday, August 16th, 2013	at 4:43 pm	. You can follow any responses to this entry through the RSS 2.0	feed. Both comments and pings are currently closed.